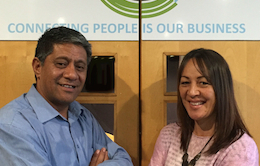 Connect Global is a Contact Centre with a difference, based in Porirua and owned by Siuai and Serena Fiso (pictured). In 2003 the Fiso’s key driver in setting up was to provide a vehicle for change, developing NZ’s most valuable resource – our people. Creating a unique work environment, which would be attractive to Māori, Pacific Island, youth and the local community. In a new bold move of “Taking jobs to the people vs people to the jobs”, Connect Global recently expanded by setting up a new office in Ruatoria. The company has successfully secured long term contracts with an impressive list of clients and received numerous awards along the way. “Our true business accolades come from our staff’s success, that comes from expecting more of themselves” said Serena. Original generation time 3.8535 seconds. Cache Loaded in: 0.0325 seconds.